Being half Austrian, half American, I’ve been to Austria many times in my life. As a child, my visits centered around seeing my grandmother, or “Oma,” in Vienna. I have fond memories of walking with her to the local bakery for fresh rolls and cakes each morning, trying to catch hedgehogs in her garden, going to the Zoo at Schoenbrunn Palace, staring up at the impossibly ornate, vaulted gothic ceilings of Stephansdom (St. Stephen’s Cathedral) in the city center, and having an ice cream at Vienna’s famous Tichy ice cream parlor. All those things are great. You should do those things when you’re in Vienna. More recently, though, my visits to Austria have been for its wine. As the wine director of a busy neighborhood café and wine bar in the Washington, DC area, I was invited to come along this year on the annual wine buyers’ trip organized by one of the main importers of Austrian wine with whom I do business. This is fairly common in the industry. Buy and promote enough wine from one wine importer, and you might get an all-expenses paid (aside from airfare) invitation to Greece or Chile or France. Of course, this is the importer’s way of saying thank you for the support. But it’s also an incredibly educational and enriching opportunity to understand the wines you’re buying on a much more intimate level. To see first-hand where the wines come from, smell the air, feel the soil. To meet the people who painstakingly tend the vines from winter’s dormancy to springtime budbreak to Autumn harvest, praying all the while for the good graces of mother nature and the weather gods. To meet the families who have made the wines for generations. To understand the unique culture and history and philosophies and traditions, which drive winemaking styles. To taste the finished, bottled product and to share a meal with the people who made it, often in their own home. My first buyers’ trip to Austria was in 2013. It was life changing. Literally. I was inspired by the people I met, by the striking quality of the wines that I tasted, by the incorporation of wine in daily life, and of course by the desire to connect on a deeper level to my own heritage (I found out a few years ago that my great grandmother was a vineyard hand in the region of Burgenland). I was so inspired that I decided to quit my wine job in the US to work the harvest and live in Austria in 2014. Over a year later, to have the opportunity to return once again, to revisit old wine friends, familiar vineyards and cellars and to taste the new wines from those cellars, was something I wasn’t about to pass up. And this time I decided to bring along my friend and coworker, Maria. It was her very first time traveling abroad. I can’t deny that I felt a certain sense of pride and excitement that Austria would be Maria’s first international experience. I did have a certain amount of apprehension about what it would be like for her being out of the US for the first time. (Book a direct flight; it’s absolutely worth saving the time and the achy muscles.) But in all honesty, for anyone deciding on their first international travel destination, Austria should be on your top five list. Nearly everyone—I mean, really everyone—even in the smallest of towns will speak at least a little English. Go to Vienna and you’re golden; practically everyone speaks English. If you’re like me, with a first grader’s grasp of German and you really want to practice, Austrians are just as happy, eager in fact, to help you polish your Deutsch. Just keep in mind that Austrians revert to regional dialects at times, even in Vienna, and especially outside of the city. They may throw in a word or two that doesn’t quite mesh with school-taught “High German.” Personally, that’s one of quirks I love about the country. Learn how to say “Oachkatzelschwarf,” correctly and watch peoples’ faces light up. You’ll make friends instantly. Navigating our way through Vienna was easy from the airport. We took the City Airport Train (CAT) into the city center, where we switched to the subway. In Vienna, there are several modes of public transport, all of which are incredibly efficient, safe and relatively clean. Between the buses, the street cars, the subway, the CAT, and the actual trains which connect all of Europe, you can get basically anywhere you need to go. You can always ask someone in the OBB train info office at each station, or someone in a uniform around the station. I also discovered on this trip that Uber exists in Vienna! As long as I was connected to WiFi, I could use the Uber app I already have on my smart phone to request a car, which ended up being helpful more than once. If you have the time, getting lost in Vienna like Maria and I did our first day isn’t all that bad, either (though going 24 hours without sleep after an overnight flight was probably not the best idea). Wandering the city, you might happen upon a festival celebrating the food, music, crafts, culture and wine(!) of Austria’s Steirmark region right in front of city hall. Or you might wander into a nearly deserted amusement park after getting caught in a rain storm, discovering mirrored fun houses, giant clown faces, and bumper cars in the truly enormous city park called the Wiener Prater. Vienna is big and is broken up into 23 different named districts, or “Bezierke.” But the city is delightfully walkable for the most part, especially within the Ringstrasse, the avenue that encircles all of the old inner city. And if you get tired, you can always pop into a smoky Stuberl for a little beer, or perhaps a stiff nip of schnapps to keep you going. A note about most bars and restaurants in Austria: like most of the rest of Europe, smoking is still allowed indoors in most places, so if you’re sensitive to cigarette smoke, beware. On the plus side, Austrians love sitting outdoors and you can find beer gardens and wine patios nearly everywhere. There are very basically four main federal wine regions of Austria, which spread over the crescent of Austria’s eastern borders. I always tell people to imagine Austria as a chicken drumstick, with the bone pointing to the west. All of Austria’s wine regions form a crescent around the meaty other end. Vienna itself is one of these wine four main regions and is one of only two European cities to also be recognized as an independent wine region (the other city being Madrid). We skipped Vienna for winery visits only because we didn’t have the time on our own and because none of the wines our importer carries are from Vienna. The other three main wine regions are Neideroesterreich (“Lower Austria”), Burgenland, and the Steiermark (Styria). You can definitely travel by train, but to visit these regions properly, I recommend renting a car and spending at least a week exploring. You’ll save time with a specific itinerary and appointments set up in advance, but it’s just as easy to tool around, stopping into the small towns, tasting at wineries with open tasting rooms and discovering which of the local Heurigers are open that day. As a buyers’ group, we traveled on a swanky government wine marketing-funded tour bus, complete with beer cooler and a TV that played this beautifully choreographed video, which was really cool the first five times we watched it. 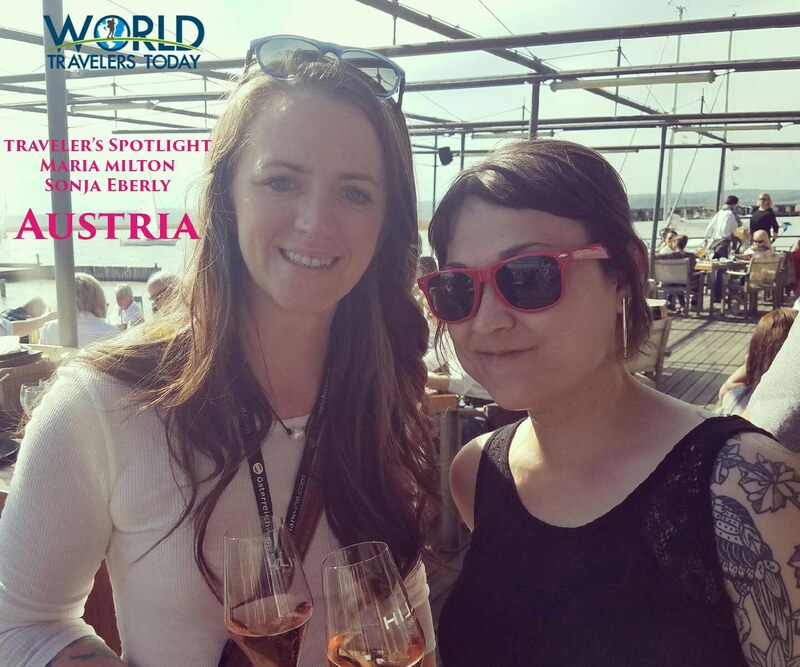 Heurigers are one of my absolute favorite parts of Austrian wine country, and it was one of my big regrets that Maria didn’t get to experience going to one. It didn’t stop me from pointing them out to her every time we passed one. I spent many a wonderful evening making new friends at communal tables, getting to know local grape growers, tasting the years’ new wines from productions way too small to be sold anywhere outside the family tavern. Heurigers are only allowed to be open 6 months out of the year and most will be open during the wine harvest, or “Wein Herbst,” from August to November. This is of course the optimal time to visit wine country. But there are always one or two Heurigers open in each town during other times of the year. Keep an eye out for a “Buschenschank,” a braided wreath or evergreen frond hanging over a doorway or a sign along the road reading, “Aus’gesteckt is,” to find the closest open Heuriger. “Get ready to eat. A lot. And really, really well.” That’s one of the first things I told Maria when preparing her for Austria. Each and every winery we visited made it a point to welcome us–how else—with lovingly prepared food to accompany the wines we were tasting. We toured almost as much of Austria’s food as we did its wines. We were served the most comfort-foody of traditional dishes like the tears-of-joy evoking Paprika Gulash that Christine Netzl made for us in Goettlesbrunn, the melt-off-your-fork Tafelspitz with apple and horseradish sauce prepared for us by Mathias Jalits’ mother in their family restaurant in Eisenberg, and the perfectly tender and crispy Backhendl served for dinner at Weingut Strauss in the Steiermark, which Maria truly loved, Southern Belle that she is. I couldn’t get over dipping hunks of freshly baked bread in the most delicious Kürbiskernöl, made from local Pumpkin seeds. We were also served the most gourmand of meals, including breathtakingly delicate Zander (freshwater perch) served with perfectly cooked Spargel (white asparagus) after an even more breathtaking tasting of single vineyard Gruner Veltliners and Rieslings (they’re, dry) with Martin Mittlebach of Tergernseerhof winery in Austria’s famous Wachau region. Our grand finale meal was hosted by Anton Bauer at the uber-fine Mörwald restaurant, housed at Graffenegg Palace. If you’re looking to splurge on an unforgettable culinary experience and you find yourself within driving distance of Schloss Graffenegg, make sure to visit and taste at Weingut Anton Bauer in Feuersbrunn, and then take a taxi up to the palace for dinner. We visited Austria in March, which meant we didn’t see any grapes on the vines, but we were just in time to see the first bud breaks all over the vineyards. We were also just in time for Spargel! But just barely. Spargel is the supremely coveted and celebrated white asparagus that decorates farmers’ markets and roadside produce stands beginning around mid-March. While prices don’t get reasonable until April when the season really sets in, we were very fortunate to have been treated to numerous meals featuring this delectable albino vegetable. The best part is seeing your Austrian dining companion’s excitement when they see Spargel on their plate, an enthusiasm that’s easy to adopt. I would be committing a grave mistake if I were to exclude a nod to the sweeter side of Austrian cuisine. Yes, perhaps it’s a truism to say that Austrian pastries—particularly Viennese—are the envy of the world (though I’m sure the Parisians would have something to say about it). There is no end to the fine selection of carefully confected patisserie in every bakery window, every glass café case, even on the breakfast tables! But of all the memorable desserts, the Kardinalschnitte made by Roland Steindorfer’s mother at their family home in Ilmitz by Lake Neusiedl is legendary. Perfectly airy, it’s almost a cloud of cake and cream, and there is nothing more suited to accompany this fluffy dessert than a sip of what the Neusiedlersee region is most famous for: Trockenbeerenauslese (“TBA”), i.e. liquid gold. This also happens to be one of the types of wines (though young Roland is developing his dry reds and sparkling roses now, too) that the Steindorfer family is most famous for. Impossibly, shamefully sweet, equally impossibly balanced and vibrating with acidity. Wonderfully harmonized. Amazingly long-lived. That is a Steindorfer Beerenauslese or Trockenbeerenauslese. Amazing cake and amazing sweet wine that create magic together; go figure. We definitely poured some of our TBA right onto our cake. Perfection. Lake Neuseidl in Austria’s Burgenland region is the largest body of water in the country. Yet, they say that a man over six feet tall can walk across the entirety of the lake without drowning. The lake itself is absolutely gorgeous and a favorite day-trip destination for people and families from all over lower Austria. On nice days, couples, families and individuals alike flock to its shores to sunbathe on docks, take boats out on the choppy waves, parasail, fish, raft, or just sit out on the deck of one of the many wine-centric restaurants overlooking the glittering waters. When she saw the photos we posted online, my mom was full of fond recollections of childhood trips to the “sea” with my great-grandmother Anna, who herself worked the nearby vineyards as a teenager. This uniquely shallow body of water creates an amazing microclimate of humidity in the region, perfectly suited for the formation of Noble Rot, that grape-shriveling fungus which means death to red grapes, but sweet immortality for the right white grapes. This fungus is what allows for the extremely labor-intensive creation of ethereally sweet dessert wines. The rest of Burgenland is primarily celebrated for its incredible range of red wines, from supple, silky Pinot Noirs like those of beautifully, wholistically Biodynamic Meinklang winery just across from the Hungarian Border, to Mathias Jalits’ structured, thoughtful, moody and complex library of Blaufrankishes, which come from the iron-rich soils of the Eisenberg DAC. And then there’s former super model Leo Hillinger’s super hip, ultra-modern winery in Jois, with its toasty, oaky robust reds. Burgenland nurtures reds for all palates and preferences. Further to the south, along the border of Slovenia, is the Steiermark, the “Green Heart of Austria,” where white wines dominate production, and mirror the styles of Italy’s Alto-Adige region more than the Rieslings and Gruner Veltliners of Niederoesterreich. Yet to put Styrian wines in any category other than their own is totally wrong. There is a distinct mineral expression in the wines that’s like no other wine region, while the whites can range from the lightest and most aromatic of Muskatellers to the nuttiest, creamiest of single vineyard Chardonnays. These are the sorts of wines and the sort of variety that you will find from Weingut Strauss, located directly across the road from the famous Gamlitzberg, a cross-hatched mountain of vines. Styria is by far, the most mountainous of all the wine regions, with gut-wrenchingly dramatic vistas and hopelessly steep vineyards. We learned that at least one person dies from a tractor tipping over in the vineyards every year. And yet, looking down at the vines plunging below the wine road along which we drove, I couldn’t help but feel an aching sense of beauty and connectedness as well. Those mountains felt like home. If you like red wines, fear not, there are certainly parts of Lower Austria that boast a range of reds, from Burgundian-trained Anton Bauer’s subtly oaked Pinot Noirs and velvety Blaufranksich and red blends, to the ancient roman ruins of Carnuntum, where Netzl cellars regal red blends and single vineyard Merlot, Zweigelt and St. Laurent. That being said, white wines—specifically Gruner Veltiner and Riesling (it’s dry! )—are crucial. And when you taste the whites from regions like the Kremstal and the Kamptal and the Wagram and the Wachau (all about 15-30 min apart from each other), you’ll see why each of these designations matters so much. 15 minutes, heck, 15 footsteps, can mean a completely different personality in a bottle of wine made from the same grapes in the same year, from even the same winery. Do yourself a favor and take the time to really delve into the whites wines of this area. There’s Tegernseerhof, with Martin Mittelbach’s pure, mineral-driven single vineyard Rieslings that will leave your taste buds reeling. And Steininger, where father Karl and daughter Eva produce not only some of the most beautiful and classically expressive method-traditional sparkling wines in Austria (they might even let you try to saber or disgorge your own bottle), but also a mind-bogglingly wide array of Kamptal-specific and reserve still wines. And when you’re completely tuckered after a very full day of tasting gorgeous wines, and hiking the 7km winery-sponsored Weinweg through the vineyards of Langenlois, trust me when I tell you that the Loisium hotel and spa is exactly where you want to end your day. If there’s only one place you decide to splurge during your time in Austrian wine country, make it this hotel. I can’t think of a better way to start and end your day than by floating in a heated pool in the middle of the vineyards, the onion domes of Baroque churches peaking up over the tiled roofs of the town and a glass of your new favorite Austrian wine at the ready.